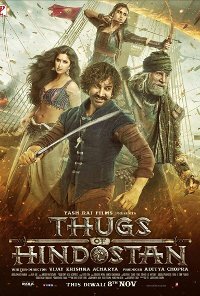 Bollywood’s take on Pirates of the Caribbean. Set in 1795, when a band of thugs pose a grave threat to the British East India Company, because they want to free India from the British and stop the slave trade. Alarmed, a British commander sends a small-time thug from Awadh to infiltrate and counter the threat. In Hindi language with English subtitles. Comments The material contains complex and mature themes of a moderate impact following a quest for freedom in India that has been enslaved by the English men, rebellion action by Indians, deceit and betrayal, seeking revenge, friendship and evil versus doing the right thing. Violence themes of losing loved ones to murder, captivity and threat to lives may be upsetting, distressing and socially harmful to younger viewers. Furthermore themes of deception, betrayal and double standards may be morally misleading to younger impressionable viewers who may not be comprehend the entertainment context of the storyline. However, there are positive resolutions of good prevailing over evil, themes of inspirational wisdom, unity, loyalty, believing in good in people, forgiveness and mitigate against a higher impact. Children under the age of 13 years may not be able to contextualise the harmful themes into the greater positive resolution of the bona fide.